Mosques are the cornerstone of the Islamic experience in America. One sign of the growing presence of Muslims in the United States has been the rapid growth of Muslim civil society, characterized by a dramatic increase in the number of mosques, social and political organizations, and advocacy groups. 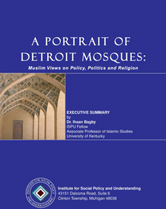 Dr. Ihsan Bagby, ISPU Fellow and Associate Professor at the University of Kentucky, believes that examining mosques and their leadership is the first step in understanding the Muslim community and a necessary step in improving their standing in the society at large. There is also a need to confront the concern in official circles and the general public that the mosques are becoming increasingly radicalized. The Detroit Mosque Study project seeks to conduct a comprehensive study of Detroit mosques and their participants. Specifically this project will do the following two things. First, it gives a detailed overview of mosque activities, finances, structures and history, along with the views of mosque leaders towards Islamic practice, mosque priorities, and America. Secondly, it will provide information on the demographics and views of mosque participants on Islamic practice and various public policy issues. Several interviews, surveys, and focus group discussions will aid in seeking this information.